This picture is not a true depiction of Central Park in the morning. The pic was actually taken in the afternoon. the blow of your best fan. that you can make it. Another draft poem, or maybe little story. I wasn’t going to link this up with anything as it is so long, but will try Real Toads open platform very belatedly. Thanks much for reading! I am posting with it an old picture of Central Park, actually from a very hot afternoon rather than early morning. This entry was posted on July 22, 2015 at 10:05 am and is filed under elephants, iPad art, poetry. You can subscribe via RSS 2.0 feed to this post's comments. This poem feels like a shell, the kind you’d pocket on a beach. The narrative voice has an underlying rhythm, a hum, I think, that feels as if it’s tapped into something ancient and deep. Methinks (for sure) a story brews in what’s still buried. I love this, Karin. I recognize this scene (literally and figuratively) and this feeling. Fleeting though it is, it will come back in another reflective moment. Once again I feel a little like you’ve peeked into my brain, or maybe my heart, and have described what’s going on in there. Thanks for that! Thanks, Steve! Sounds fantastic. K.
You really create an organic world here, k–the opening, with the shirt on the floor, and all the nuances of mood that you introduce with linen and wood, is very personal and human, as is the feel of crowding replacing the early morning peace, when heat and rush cancel out most forms of clarity…a very alive piece, full of summer and city. And elephants, disporting themselves, of course. 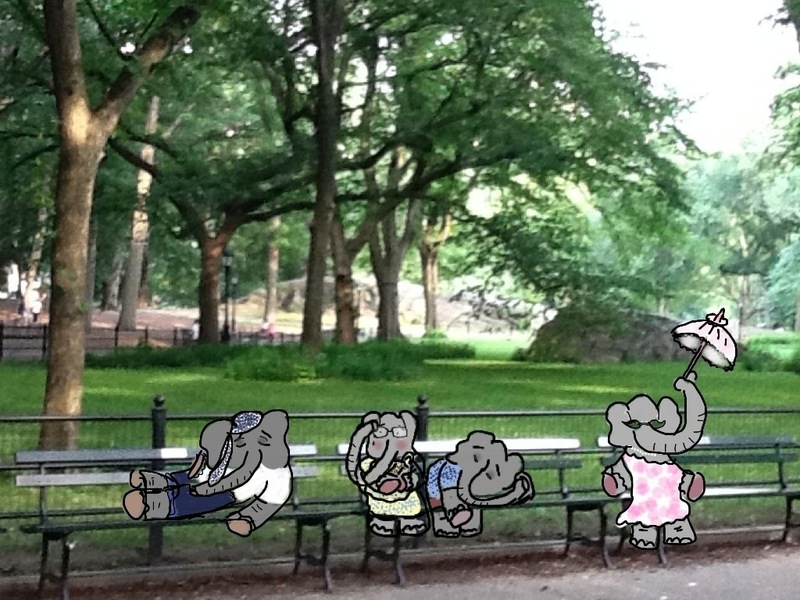 ps — It is an old drawing (from a couple of summers ago, I think), but I do like the elephants. k.
from a burning building..’ and so much more. Very rich in flavor and content, k. replete with contrasts and a sort of distillation of them into graceful acceptance of each. I have a new poem that I am about to put it up. It feels very much like the same poem– in a bit of a rut. I’m sorry to come to this poem so late in the week. I was lucky, in my youth, to spend a day walking the streets of New York. Just a single day but I have never forgotten the spirit of place, and I feel it again now, reading your words. Thanks. NYC certainly has its good and bad parts and its “walkability” is probably one of the very good. I would love to go to S.A. some day. All too far! k.
ps –I am actually trying to work on a little doggy book right now. It is an old book, but I am trying to revise and do a bunch of little pictures. Agh. I am not really an illustrator or a draftsperson, but I am hoping to take my sketches, put them on my iPad and then trace them with a firmer line that looks more illustrational. Only it seems like an awfully lot of work! But I hope I can persuade myself to stick to it. Take care, and thanks for your kind words. k.